Fly fishing might be a more specialized type of fishing, but it’s a sport many Oklahomans enjoy year-round. The waters of Oklahoma are regularly stocked, creating a spectacular habitat for fish to thrive. Rainbow and brown trout love the winter months when the crappie and bass go dormant. Here are five of the must-visit fly fishing spots in Oklahoma. There is a year-round trout fishery here, and the river is stocked every week. There are at least five public access points where you can easily get to the water. You can’t camp here, but there are plenty of places to camp. You’ll want to read up on the rules and limitations. Brown trout have to be a minimum of 20 inches and you can only take one per day, but the rainbow trout have no minimum length and have a six per day limit. The area is home to a lot of wildlife, and you may even spot bald eagles in certain seasons. This is the other spot in Oklahoma where trout fishing is a year-round sport. Many people call this river the premier spot for trout, but there are many other types of fish in season when you come here. The foundation has a lot of information about the fishing regulations, which can change due to conditions outside of their control. Generally, the regulations here are the same as the Lower Illinois River, one to 20 inches or longer brown and six rainbow trout daily. No culling is allowed, and you must use a rod and reel or pole and line. 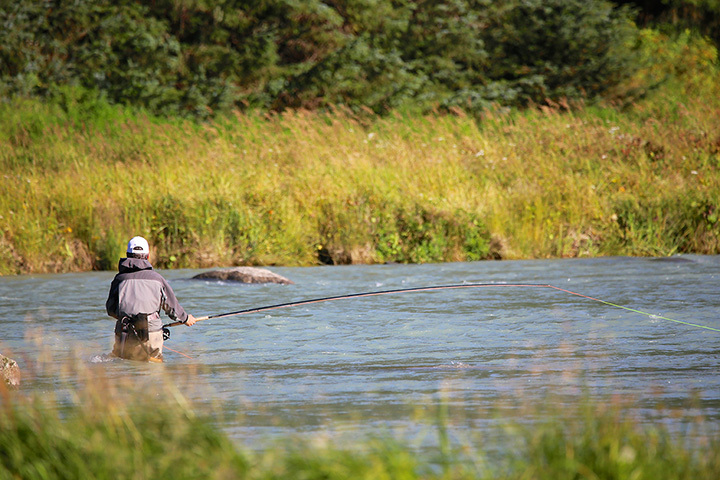 The Blue River has year-round fishing, and from Nov. 1 through March 31, Blue River is a designated trout stream. They have two trout derbies during the season, and they love younger anglers. Best of all there is no fee for camping, but you must have a fishing or hunting license to camp. Baron Fork is a tributary of the Illinois River, and it’s been said that “the Baron Fork Creek compares favorably with the best streams in the Ozark Highland region.” It’s probably more well-known for sand bass and black bass, but it has at least 23 species of fish in its waters. It’s a very healthy aquatic habitat where you can enjoy fishing, nature and more. This river is the last freestanding river in Oklahoma. It’s not dammed, nor is it commercialized. It’s known for smallmouth bass, but has many different types of bass, channel catfish and sunfish. It has Class I and II rapids, making it perfect for rafting and kayaking, but the river is in a beautiful location, with steep bluffs and towering pines lining the banks of the river. You can access the river through the U.S. Forestry Service land. You might want to check conditions before going in the summer, as the stream can dry up if we’ve had a hot, dry July and August. The fish will look for deeper holes to hide until the September rains refill the basin. View more Oklahoma Fishing Holes.